Jose Mourinho applauded Manchester City’s Premier League title success, but lambasted Manchester United after West Bromwich Albion’s shock 1-0 win on Sunday. In order to prevent City from being crowned champions for a few more days, United had to avoid defeat against bottom club Albion at Old Trafford. But Jay Rodriguez’s 73rd minute header gave West Brom a stunning victory after they arrived at Old Trafford having lost nine of their previous 10 games. It is ironic that United came back from 2-0 down against City themselves last weekend to win 3-2 and delay City’s party, only to surrender so tamely on home soil. “I don’t know if I was the first or second or third but I congratulate them face to face when I had the chance,” Mourinho said. “I knew that sooner or later they would be (champions) and if I was in their position I would be very upset if someone said they won the title because Manchester United lost against West Brom. “They won because they were the best team, they lost only a few points. Probably because I won eight championships, I was not in the moon with the victory against them. United’s afternoon was symptomatic of their entire season. Mourinho pulled no punches about his squad’s lack of consistency, but the former Chelsea boss made it clear he believes he can return United to the summit of English football. “I trust in my work, that is for sure – I have no reason not to trust,” he said. “Eight titles are eight titles and three Premier Leagues are three Premier Leagues. I know how to win and I believe in myself. I think with my experience you don’t win titles with inconsistency. “You win titles with consistency at every level, not just the performance level but the mental level and the day by day. Jake Livermore had one decent effort saved by David De Gea and Lukaku smashed an effort right into Ben Foster’s face but that was about it. 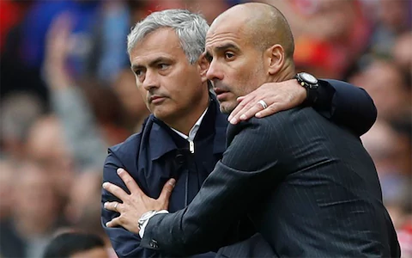 The post Mourinho slams United as they hand title to City appeared first on Vanguard News.